Aqua Magic Moves is aquatic choreography on steroids! Great movement ideas and variations for upper torso, lower torso, and combinations to give your brain and body a unique workout. 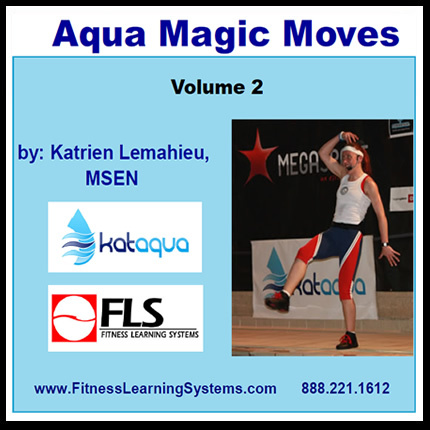 Aqua Magic Moves can be used for group fitness, personal training, therapy, and for athletic populations. Over 100 videos included. Aqua Magic Moves is designed to help instructors combine arm and leg patterns and make them into new exercises. They have the Magic to be executed in so many different ways that you will never run out of choreography ideas. There is theory included, cue recommendations, and other ideas you can use to execute the moves and understand the philosophy behind the system. You will see that once you start you can’t stop because the variety is endless! 3 NEW MOVES, over 100 video’s with variations for: Circle 3 ski, Corner Kick and the Rocking Mambo.